Helps restore levels of many micronutrients depleted by alcohol. 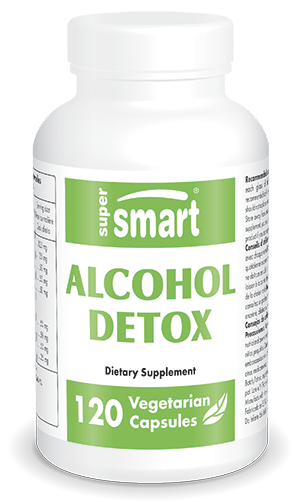 Alcohol Detox contains thiamine, benfotiamine, N-acetyl-cysteine, ascorbic acid, sodium R-lipoate and silymarin which act synergistically against the damaging effects of alcohol consumption. This new formulation also contains asparagine, Picrorhiza kurroa and kudzu to further boost its efficacy. ¤ Acetaldehyde, a by-product of alcohol metabolism by the liver, is thirty times more toxic than alcohol itself. It encourages the formation of cross-links between glucose and proteins, a process known as ‘glycation’. Alcohol metabolism also significantly increases free radical production which, if left unchecked by antioxidants, results in major oxidative stress. - the fall in vitamin C levels, the main water-soluble antioxidant, results in serious oxidative stress in heavy drinkers, as well as lower concentration of endogenous antioxidant enzymes – superoxide dismutase, catalase and glutathione peroxidase. ¤ Combined with vitamin C and N-acetyl-cysteine, thiamine protects against acetaldehyde toxicity. ¤ N-acetyl-cysteine, sodium R-lipoate and thiamine, sulphur-based nutrients, also contribute to detoxification of acetaldehyde. - sodium R-lipoateis involved in glutathione recycling. ¤ Vitamin C plays a crucial role in protecting brain cells against alcohol-induced oxidative damage. ¤ Benfotiamine, a fat-soluble thiamine derivative, prevents and slows down acetaldehyde-induced glycation. Simultaneous supplementation with fat-soluble benfotiamine and water-soluble thiamine is essential in order to prevent some of the more harmful effects of chronic alcohol consumption. - it reduces mortality rates in cirrhosis patients. ¤ Administration ofasparagine reduces blood concentrations of acetaldeyde by over 30%, so preventing alcohol toxicity. ¤ Extract of Picrorhiza kurroa stimulates liver regeneration. Studies suggest it is effective at protecting the liver from biochemical changes caused by a number of toxins. ¤ Kudzu contains flavonoids (puerarin, diazine ou daidzein) which help reduce damage from excessive alcohol consumption. They appear to act by inducing activity of alcohol deshydrogenase (ADH), thus reducing the concentration of alcohol in the body. The benefits of these active principles are now available in the new formulation Alcohol Detox. Combined in a single capsule, this concentrate of active principles can help regenerate and protect the liver, especially against the harmful effects of alcohol. For optimal liver protection, you may also be interested in a powerful and natural chelator called zeolite clinoptilolite. Studies suggest this compound can reduce the body’s alcohol absorption by around 40%. adults. Take one capsule with each glass of alcohol. Attention : Alcohol Detox will not prevent you from getting drunk nor affect your blood alcohol levels. However, Alcohol Detox can significantly reduce alcohol’s harmful effects: hangover, malnutrition, oxidative stress, liver and brain toxicity.